I have years of teaching experience with children and now adults. I am available to teach either at your venue or my own lovely studio. If you come to my studio you will be part of a small group with plenty of help when needed. Please read the comments below from some of my students. Thank you for such a brilliant day yesterday. Lovely company, wonderful tutoring and I suspect I want to do more! You were brilliant and so encouraging, thank you. Jane. Thank you so very much Anna for a well organised day. We thoroughly enjoyed ourselves in your calm and organised studio. We both learnt so much and you will be hearing from us again for more sessions. Mary. I was very pleased with this course. Anna was the perfect tutor, lively and very patient. Good tempo and lots of freedom to work as we wish. Great! Another lovely year! Thank you! Lino cutting was one of the best classes I have done in the 8 years of coming. Anna was just lovely - really liked her and her teaching method was very relaxed and easy. Look forward to next year. 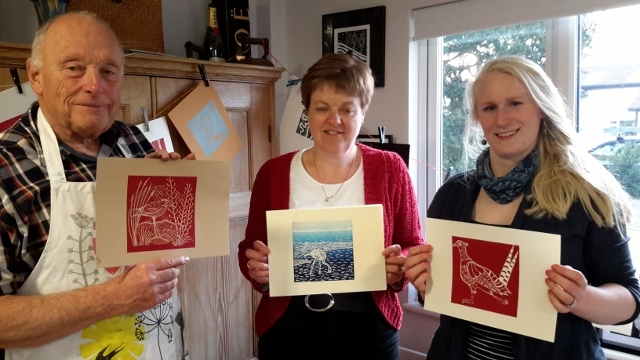 Exploring lino cut and printing with Anna Pye. Absolutely loved it! A relaxed, informative class, plenty of instructions and encouragement. Would love to do it all again. Excellent! Thank you Anna, for your relaxed yet focussed tuition and support. I've learned lots and got some lovely work done. Very encouraging when I felt I'd set out on too complex a print - it came out very well! Hope to see you again.